The show of forces comes as the leaders of Iran, Russia and Turkey are meeting Friday in Tehran to hammer out their next steps in the seven-year Syrian civil war ahead of an expected offensive led by Syrian President Bashar al-Assad’s forces into the country’s northwest Idlib Province. “The United States does not seek to fight the Russians, the government of Syria or any groups that may be providing support to Syria in the Syrian civil war,” Navy Capt. William Urban, a spokesman for U.S. Central Command, said in a statement. 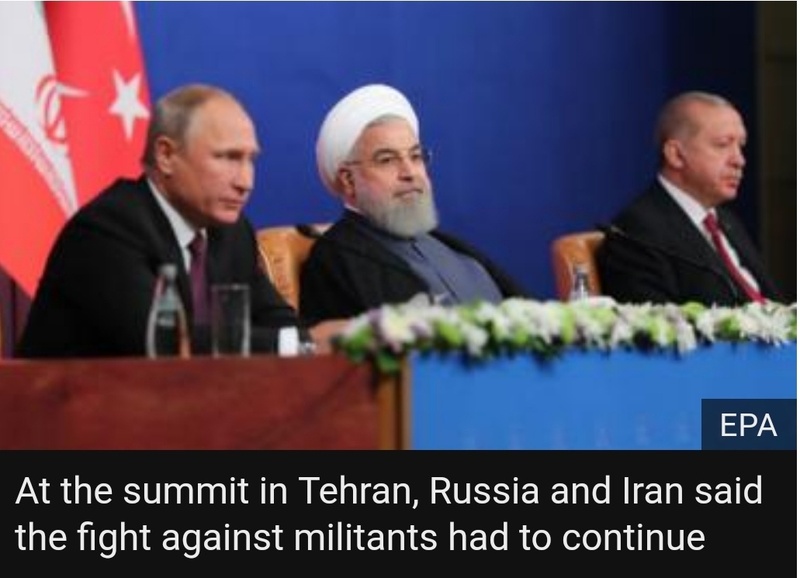 In Tehran, the trilateral summit between Iranian President Hassan Rouhani, Russian President Vladimir Putin and Turkish President Recep Tayyip Erdogan was meant to finalize military plans for the “total annihilation of terrorists in Syria,” Putin said. The area is home to three million people, including hundreds of thousands of civilians living among rebel fighters including thousands with ties to al-Qaeda. “We consider any assault on Idlib to be a dangerous escalation of the conflict in Syria,” said U.S. ambassador to the United Nations Nikki Haley Friday in New York. “Airstrikes by Russia and the regime have already begun against civilian areas. “The atrocities committed by Assad will be a permanent stain on history and a black mark for this council which was blocked over and over by Russia from taking action to help,” she added. “Exercises like this bolster our defeat-ISIS capabilities and ensure we are ready to respond to any threat to our forces,” said Navy Capt. Bill Urban. The rare show of force in Syria comes months after U.S. aircraft — including AC-130 gunships, jets and bombers — killed roughly 300 Russian mercenaries near Deir al-Zor in eastern Syria after American special operations forces came under attack. “The Russians agreed to a [34 mile] ‘deconfliction zone’ around the At Tanf garrison to avoid accidental conflict between our forces, and to remain professionally engaged through de-confliction channels. We expect the Russians to abide by this agreement,” Urban said. The Russian provocations were not limited to Syria. Friday, the North American Aerospace Defense Command said a pair of fifth generation U.S. F-22 stealth jet fighters from Alaska intercepted a pair of long-range nuclear-capable Tu-95 “Bear” bombers last Saturday flying south of the Aleutian Islands. It was the first known flight of Russian bombers near the United States since May. The summit between Rouhani, Putin and Erdogan may determine whether diplomacy halts any military action. Iran, Russia and Turkey will never reach any agreement since each one of them has its own agenda for Syria. https://uploads.disquscdn.com/images/958f12007338f774916356ff61e45a8959483d6648340d7128f0b928a12394ea.jpg Even before it began, an airstrike early Friday struck Idlib’s southern edge, killing at least one person. The question is who really cares about the Syrian people – Assad…. Trump said his own opinion withe the US Marines that launch live-fire air assault into Syria desert in ‘strong message’ to Russia… ???? Idlib is not a joke, it will end as a tragedy. Yes, it will end as tragedy And your comment is best understood either as gallows humor or magical thinking. Turkey and Erdogan was out-matched at the meeting. 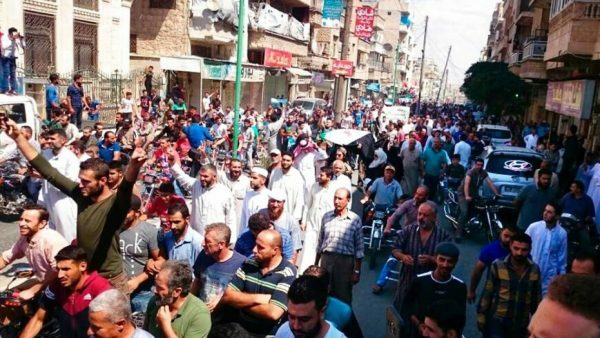 Russia and Iran have long pursued policies and campaigns that will culminate in Idlib being flattened in the manner enjoyed in Homs and other Syrian cities. The “international community” — including and not limited to the United States, Jordan and Turkey — have long pursued policies and campaigns of permitting Russia and Iran to have their way with Western Syria. No White Knight is coming before the fall. And the world is obviously Okay with all that. A tragedy that so many will be driven out (a key objective unto itself) and killed (a necessity to accomplish the driving out). But as the end draws near, victory will not be denied by calls for more humanitarian actions on the part of the conquering militaries — they are there to do a job and that doesn’t involve protecting in situ life; much the opposite.